Pixelache | Abandoned Mystery: Salpa Linja Camp 02-07.9. News : Abandoned Mystery: Salpa Linja Camp 02-07.9. This 5-day expedition/camp to Miehikkälä municipality, in the Kymenlaakso region of South-eastern Finland, from 02-07.9. is part of Abandoned Mystery multi/trans/un-disciplinary pilot project exploring the constitution and phenomena of abandoned military sites on the European edges of the Baltic Sea area. We seek 1-2 interested creative practitioners or researchers from Southern Finland to join the expedition! Previous expeditions have taken place in the Pre-WWII fortifications, Soviet military heritages in Koenigsberg/Kaliningrad in Baltic Russia, Memel/Klaipeda, Taurage, Plokstine and the Curonian Spit in Lithuania, and Liepaja, Irbene in Latvia. Participants backgrounds and interests in art, (social) science, history, anthropology, architecture mythology, and heritage issues. 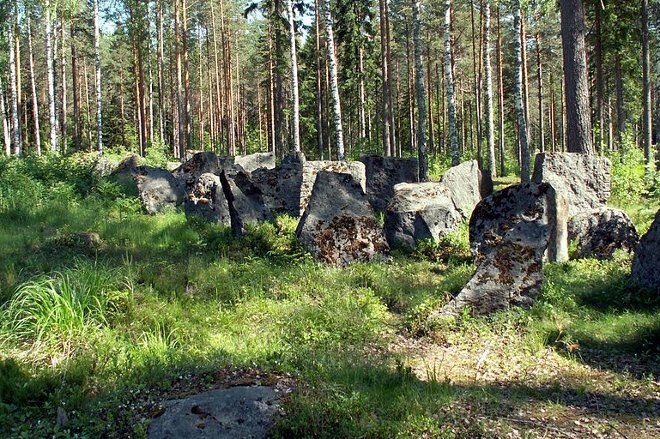 The Salpa Linja, within tens of kilometres from the current Russian border, was a fortification line built by Finland as defence from the Soviet Union between the Winter and Continuation wars. The Miehikkälä municipality created a museum in their area of the fortification line in 1987. Nowadays a network of trails within forested heathland, lead to zigzag lines of trenches, gun emplacements, concrete bunkers, barbed-wire obstacles and anti-tank ditches. The area attracts various types of enthusiasts with different motivations. The Salpa Linja expedition will contribute to Abandoned Mystery project with further exploration into the inter-related and overlapping issues of artistic and cultural event production, cultural heritage, online and offline preservation. The camp and expedition in practice means visiting various outdoor locations in Miehikkälä, and engaging with or researching a phenomenon encountered (either as media or textual documentation; performative action or interaction). Accomodation includes a nearby villa lodge sleeping 7 persons, and minivan transportation. The group of 7 in total will be international and multi-lingual. Participation is free, and there is a modest fee (100e) for contributing appropriately to the project documentations. Travel eastward begins from Helsinki, but you could be picked up if you live reasonably within route. If you are interested to join, write to andrew [-at-] pixelache.ac before Monday 20.8. expressing your motivations and experience. You would be notified that same weeek of acceptance into expedition/camp. The camp is organised by Andrew Paterson (Pixelache Helsinki) in collaboration with the Lithuanian Interdisciplinary Artists' Association, and is supported by Kultur Kontakt Nord and Goethe Institute. Photo credit: Jniemenmaa, Wikipedia commons.